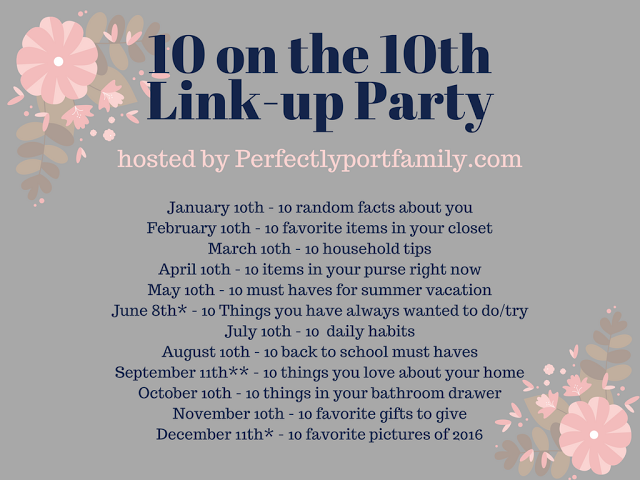 Today I'm linking up with Erin at Perfectly Port Family to share 10 things I love about my home! The photos are kind of a spatter of old and new because I was trying to save myself a little time rounding things up! I love my boys and am so thankful to live with them and have them for mine. We argue. We grouch. We even yell more than I'd like, but we love each other hard, too. We hug. We cuddle. We take care of each other. We fit into our home perfectly well and I love it. And I love them. We bought our first recliner when Wesley was a baby and was first starting to have his breathing issues. Prior to that we had a glider which was fine for nursing and rocking, but not for sleeping in. When I would have to hold Wesley upright so he could breathe to sleep, I told Russ I wanted a recliner and we went to buy one the next day. We now have two of the same recliner, one in Calvin's room and one in our living room, and I love them. They are great for holding sleepy kids, having two kiddos in my lap to read stories, and kicking my feet up to watch TV or work on my computer. They were one of the best purchases we've made. Our driveway is really a place people gather. The neighbor kids come over to play, the boys shoot hoops and race their vehicles around. I spend so many hours perched in a chair watching the fun in our driveway. It's a little sad when cold weather hits and the kids don't play outside much. One thing we really wanted when we moved in to our forever home was a nice back yard that was fenced in. We got it. We have a big play set and I can see out there when I'm working in the kitchen. The boys play ball, slip and slide, and dig back there so much. It may not be picturesque, but I love the that is an awesome place to play. I also love our deck! It is spacious for entertaining and just hanging out. We can eat dinner on the picnic table. We can sit out by the fire pit. The boys can paint and get messy on the picnic table. Russ grills up and smokes up delicious food. It's perfect for us. One thing our home does lack is a fireplace. I have always wanted a mantel to decorate, but this shelf we made from an old ladder fills that void for me. This idea came from Pinterest way back when. I had it hung in our old house in our living room and now it hangs above our dining room table. Our first home had a mud room, but in our home, the garage door connects right by the front door and you head right up or down stairs. 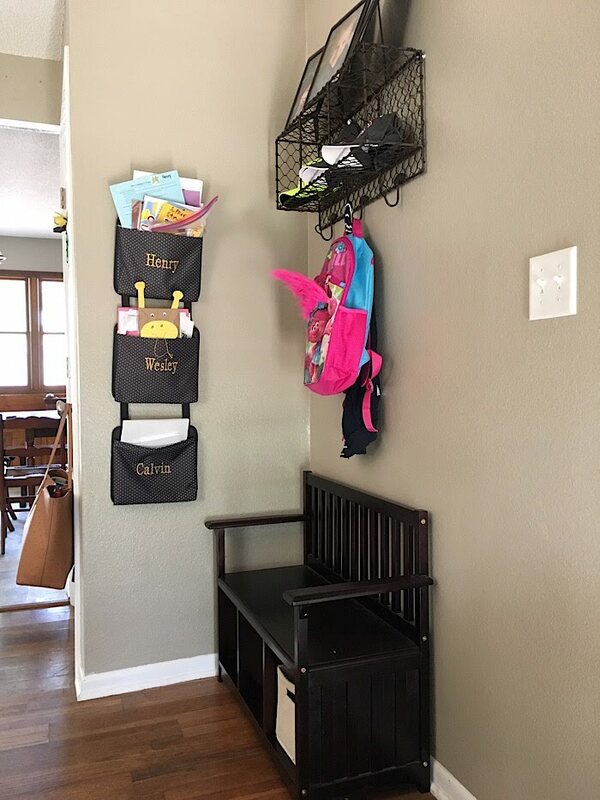 I wanted to have a place to hang the boys' coats like I did in our old mud room and have a place for their shoes, too. This spot works great for it. And the pockets with their names on them are awesome for holding school papers and more (though I probably need to go through and clean them out). We have a nice toy zone downstairs. 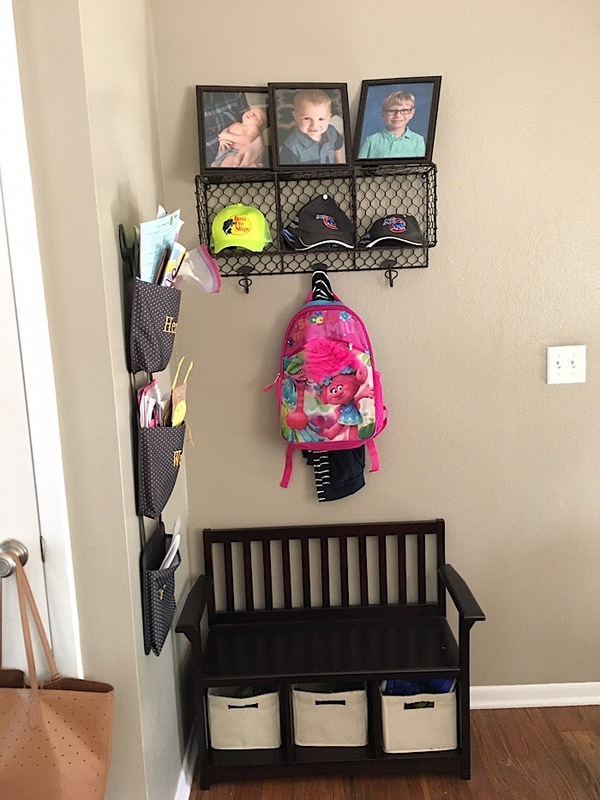 This is just a photo of the Nerf holder, but we have a space the kids can play and keep most of their toys so it contains the chaos somewhat. Though they drag toys all around the house. The toy area can be a landing zone when we want everything cleaned up. We we moved into this home from our first home, we went from one living room to two. This meant I got to pick out new furniture for the second living room! 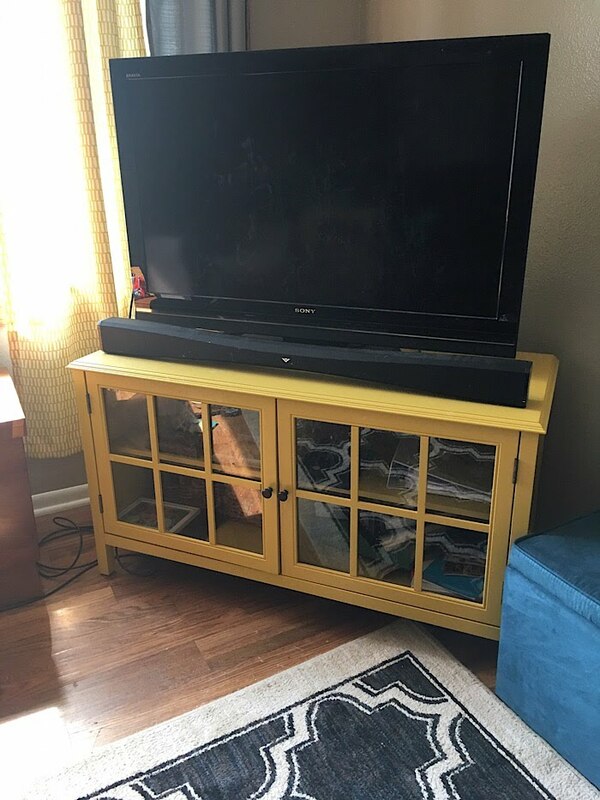 I picked out the mustard end table and TV console first and I just love them (they're from Target by the way). They just add some pop to the room and I love it! To some our home might look old or small. To some our home might look like a starter home that people would move out of once they settled and had more kids or more money but to us it is perfect. It has beautiful indoor and outdoor spaces that are fully used and I couldn't be more happy here. Honestly Russ and I were having one of those "if we won the lottery" dream discussions the other day and we both agreed that if we won the lottery, we would stay in our home. Sure, we would upgrade things like having sliders in the kitchen cabinets, having a gas stove, a king sized bed, and a more fancy refrigerator, but all in all we are content and thankful for the home that covers our heads and the memories we're making here.